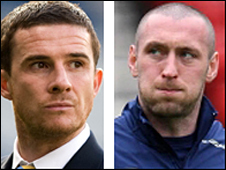 Scottish FA president George Peat has ordered a probe into the drinking session that resulted in Barry Ferguson and Allan McGregor being dropped. The Rangers players were disciplined by manager George Burley and were on the bench for Wednesday's World Cup qualifier against Iceland at Hampden. "I want a full, detailed explanation about exactly what happened at the team hotel on Sunday morning," said Peat. "Who gave the players permission to have drinks and why?" Peat has reopened the affair at the team hotel after SFA chief executive Gordon Smith and manager George Burley had declared the matter closed. The SFA president is also unhappy about newspaper photos that appeared to show the Rangers pair making V-signs while sitting on the bench during Wednesday's game. "I want to know exactly what the behaviour of the players involved was like and if there were complaints made to the hotel by guests who may have been upset by what they saw or heard," said Peat. "I want to know everything and I also want to know why those two players made the gestures which were all over the newspapers on Thursday morning. "I want to know who those gestures were aimed at. "It will be up to either the manager or chief executive to bring that information to the table. When the full report is ready, it will go before the full board and then we will see where we take it from there." The SFA had on Thursday announced that Scotland players will be issued with a code of conduct and Peat warned that a repeat of the incident at the weekend would result in Ferguson being stripped of the skipper's armband. "When this code is in place, any breaches of the rules similar to the events on Sunday would or could result in players being automatically removed from the squad or even the captaincy." Do you think the incident been well handled? Smith had earlier backed Burley stance over the behaviour of goalkeeper McGregor, who has made four Scotland appearances, and midfielder Ferguson, who has earned 45 caps. "I fully support George's decision," he said. "It was clearly taken in the best interests of the team and country." Smith and Burley had met on Thursday to discuss the events surrounding the drinking session involving Ferguson and McGregor after the 3-0 defeat by the Netherlands. The chief executive, who stressed that the players had not "broken any curfew", suggested that the pair would receive no further punishment.